A Labour Party candidate standing in the swing seat of Dundee East in May’s general election has declined a £1,000 campaign donation from former Prime Minister Tony Blair. Lesley Brennan, parliamentary candidate for the Scottish constituency, said on Twitter her “instinct” was not to accept the offer. However, senior Labour sources indicate she will be unable to return the donation because it was made through the party’s central office. Blair’s pledge to donate £1,000 to each of the candidates in Labour’s 106 key “battleground” sites was criticized by Welsh national party Plaid Cymru last week. Rhodri Glyn Thomas, a member of the Welsh Assembly, described the campaign contributions as “blood money,” citing the former Labour leader’s work for authoritarian governments. Received donation from Tony Blair. Instinct was to not accept. Discussed with team. Dundee East is not accepting the £1000. Despite her public rejection, sources within the party have indicated she cannot turn down the money because it will come to her through Labour’s national campaign budget. “She thinks Tony Blair’s office is going to write the Dundee Labour Party a check but it all comes through national spend,” an unnamed Labour source told The Courier. In a letter sent to candidates accompanying his £106,000 pledge to Labour’s election campaign, Blair said he was giving them the money because he knew the outcome of their battles would determine whether Labour wins the general election. “I know how hard it can be to raise money to fund a local campaign, but for you, in one of our 106 battleground seats, it is even more vital,” he wrote. Thomas, a Plaid Cymru member of the Welsh Assembly, urged candidates to return the donations. “The former prime minister since leaving office has amassed a multi-million pound fortune by doing the bidding of the global banks that created the longest lasting recession since records began with their rotten behavior,” he said, speaking to the Daily Mail. “He has worked for multinational energy companies who have rigged the energy market created by his Labour government resulting in inflated energy costs for consumers, and global dictators guilty of human rights abuses. “It is deeply disturbing that this blood money will now be used by the Labour Party in Carmarthenshire,” he added. Blair’s election campaign donations come less than two months after MPs demanded he reveal the identity of his paymasters. Tory MP Andrew Bridgen tabled a motion in Parliament earlier this year demanding former prime ministers be bound by the same rules of transparency and oversight as serving politicians. 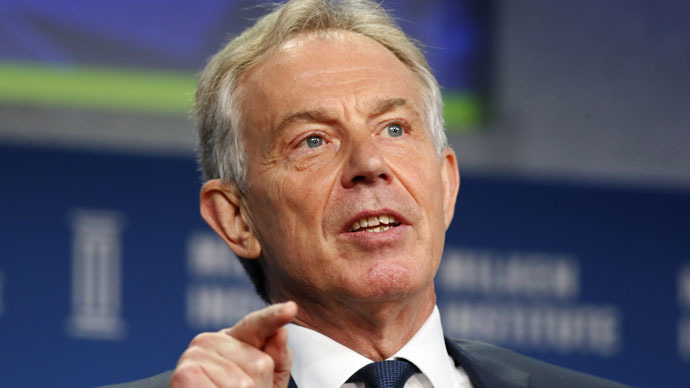 “Tony Blair has embarked on a career of personal enrichment and has blurred the lines between his public and private interests,” he commented to the Sunday Times. Since leaving office in 2007, Blair has courted controversy for doing business with repressive regimes and unscrupulous companies. He has worked for the governments of Saudi Arabia, Azerbaijan and Kazakhstan and advised energy company BP on a new gas pipeline.